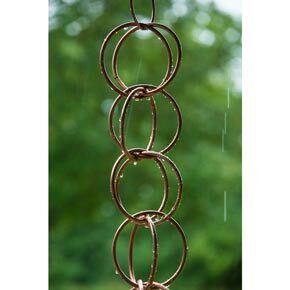 Home » Tools and Décor » Polished Copper Rain Chain 4"
Rain chains have been around for centuries, delighting young and old with their tinkling sounds as they funnel water away from doors and windows. 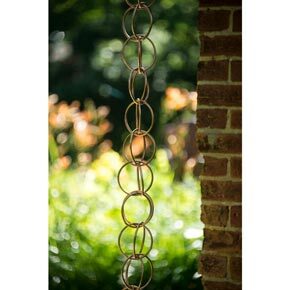 Our shimmering, polished copper version features a 4" double linked-circle design that gives off a nice glow. 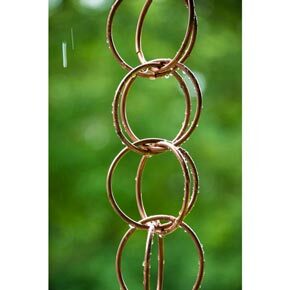 As the rain chain ages, the copper will develop a rich verdigris patina for a completely different look full of old-world charm and charisma. At 6' long, it is the perfect length for easy hanging from eaves and rooflines. Hang it near a window and enjoy the show all year long. Adds a wonderful decorative touch to patios, porches or decks, too. 6"Lx4"W.